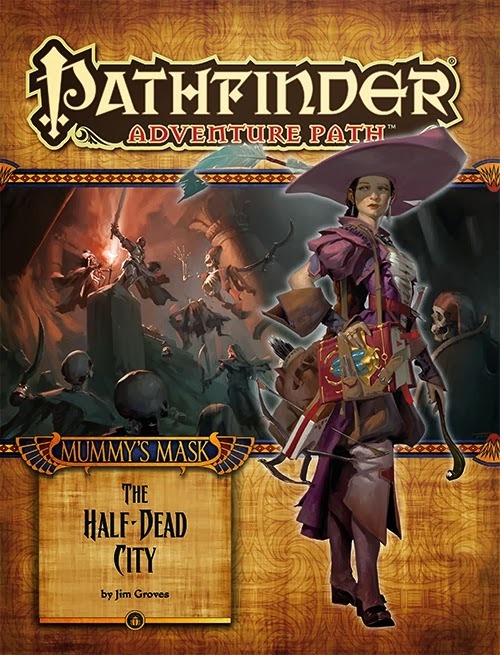 The cover image today comes from Paizo Publishing's upcoming first installment of the Mummy's Mask, "The Half-Dead City," written by Jim Groves. In part 2 of Encounter Table's desert-themed week, we take a look at the living mirage; a prestige class that blends illusion magic and martial arts to create a fighting style based on the hazy heat mirages of the desert. The living mirage should fit right in among the PCs or NPCs of your Mummy's Mask campaign as ally or adversary. Deep within the vaults of Orv, there exists a desert realm of toxic night known as the Black Desert. Within this inhospitable wasteland, an ancient order of monks descended from surface explorers devoted their lives to the study of blending their martial arts with illusion and shadow. The disciples of these monks eventually traveled beyond the vaults of Orv, making their way back to the surface world where they, in secret, trained others in the way of the living mirage. A living mirage blends monastic mysticism with illusion magic to create semi-real shadowy duplicates of themselves to aid them in battle. In battle a living mirage is a haze of shadowy duplicates that flicker and flourish from one opponent to another, befuddling foes while embodying the phantasmal mirages of the Black Desert. Role Living mirage is a highly defensive class and characters that take levels in it excel at fighting one or more opponents in combat, hiding behind their illusory doubles and using a mixture of melee combat and arcane spellcasting. Alignment Many living mirages are monks that dabble in arcane spellcasting and therefore come from a strict lawful background. However some practitioners of this art are ninja, not bound by such principles. As such, alignment among living mirages is as fluid as their illusory defenses and can vary widely in attitude. Prerequisites Spellcraft 5, Perception 5, ki pool, ability to cast mirror image or use mirror image as a spell-like ability. To qualify to become a living mirage, a character must fulfill all of the following criteria. Spells Ability to cast mirror image or use mirror image as a spell-like ability. Weapon and Armor Proficiency A living mirage gains no additional proficiency in weapons or armor. Spells per Day At 1st level and every other level thereafter, the living mirage gains new spells per day as if he had also gained a level in a spellcasting class he belonged to before adding the prestige class. He does not, however, gain other benefits a character of that class would have gained, except for additional spells per day, spells known (if he is a spontaneous spellcaster), and an increased effective level of spellcasting. If a character had more than one spellcasting class before becoming a living mirage, he must decide to which class he adds the new level for purposes of determining spells per day. Ki Magic (Su) When a living mirage casts a spell he may spent a number of points from his ki pool equal to the level of the spell to cast it without using up a prepared spell slot or spell per day. Additionally, whenever a living mirage uses an ability that requires expending points from their ki pool, a living mirage may instead use a prepared spell or one of their spells per day equal to the number of ki points spent, instead of expending points from their ki pool. A living mirage's levels in this prestige class stack with other class levels that contribute to their ki pool. Shadow Mirage At 2nd level the mirror image spell is considered to have the shadow descriptor for the living mirage and is 50% real. Mirror image now grants additional effects due to this change. As long as the living mirage has at least one mirror image active, he gains a +4 bonus to AC from soft cover. The mirror images gain 50% of the living mirage's modifiers to AC in addition to the living mirage's full size modifier to AC (if any). Each mirror image requires two successful hits to destroy. Mirror Flanking (Su) As a swift action at 4th level, a living mirage may sacrifice one of his mirror images to target a creature within reach with a distracting illusion. The target must make a Will save (DC is equal to the living mirage's mirror image spell) which, if successful, negates the mirror flanking ability, but the mirror image is still sacrificed. If the target fails its save, the sacrificed image appears in the target creature's square and harries them with flourishes and feints, granting the living mirage flanking against this target. The image may be targeted by attacks at its normal AC and destroyed. Since this image no longer exists in the living mirage's square, it is immediately destroyed by an area of effect that deals damage to the target creature's square. Mirror flanking lasts a number of rounds equal to the living mirage's level. Mirage Melee (Su) At 6th level the living mirage may, as a swift action, sacrifice multiple mirror images in a flurry of attacks. He gains one additional attack at his highest attack bonus per mirror image sacrificed, up to a maximum of bonus attacks equal to the living mirage's Intelligence modifier. Any creature targeted by these attacks may make a Will save (DC equals the DC of mirror image) that, if successful, reduces all damage dealt by the attack by 50%. Image Leap (Su) At 8th level the living mirage may, as a move action, sacrifice one of his mirror images by projecting it out up to a distance of 100 feet to any point within line of sight. The living mirage then uses this mirror image as a conduit by which he travels through the plane of shadow instantaneously, arriving at the image's destination. Phantom Strike (Su) Once per round at 10th level, the living mirage may spend one point of ki as a free action to resolve a melee attack as a melee touch attack. I wonder how this would work adapted as a magus archetype? I think it might be challenging, but it would also take away from some if the theme of the prestige class. As the commenter below noted, a Magus/Monk could qualify for it and be quite effective. I am seeing this as excellent for a multiclass magus/monk. Use that item from the new magic shops book that combines your ki pool and magus arcana, and you have yourself a potent defensive warrior. I haven't seen that item yet, I assume it was in Magical Marketplaces? That sounds like a perfect fit for this PrC though! What is the duration for the Mirror Flanking ability? How long does the image stay in their square? And does it actually give Flank? You don't specifically say it. Excellent question! My intention was for the effect to last for the duration of mirror image and for the image to move with the enemy. I'll update this with some clarifying verbiage.